Peter is reputed to have appeared in a number of television adverts in Europe (Germany and Ireland) and America when he decided to concentrate on acting but we currently have no further information about these. 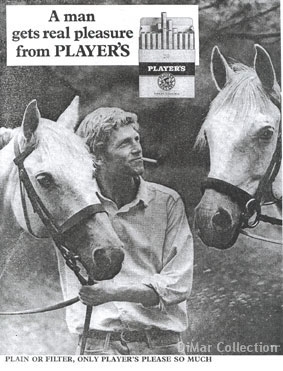 He did however appear in a magazine campaign consisting of four different adverts for Player’s cigarettes in 1967. One evening Diana was looking through some old issues of the Radio Times at Westminster Reference Library, searching for further info on Anne and Peter’s television roles. She turned a page, glanced at a picture and thought, “Oh that looks a bit like Peter”, took a closer look and literally almost fell of the chair when she realised it really was him. She hurriedly looked further and found two more advertisements featuring him (see below!). A fourth was discovered a few months later. Marianne had a similar reaction when Diana later showed her the adverts at the library. Before I could say more the librarian took the book, had a good look at it and said: “Okay, you can copy the advertisements as long as you promise to handle the book like a baby”. I almost kissed the man and waved at an anxious looking Diana. We handled the book with care and made many copies that evening. We were very grateful to be given special permission to copy the adverts but we longed to obtain the originals. Fortunately, we have since managed to track down issues of the Radio Times containing the four ads and they are proudly on display in our homes. 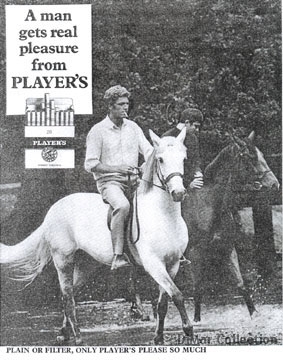 Peter may well have appeared in other advertisements - we continue our search for these.